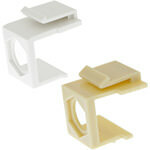 Modular Furniture Termination Jack Plates vary greatly in style and size. These accessories are generally extraordinarily costly if purchased from the manufacturers since they are proprietary, and most manufacturers see this line of products as a huge margin opportunity. 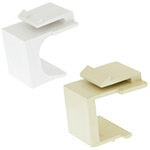 This Keystone F-connector housing piece is essential for any necessary replacements and fits into any keystone wall plate or patch panel. 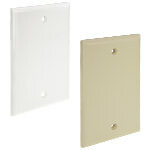 The single gang blank wall plate covers up compatible surface mount boxes and comes in either white or beige. 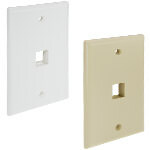 The 1-Port Keystone wall plate provides a connection for cable and high-speed internet applications. The 2-Port Keystone wall plates allow for a pair of connections with both high-speed internet and cable applications. 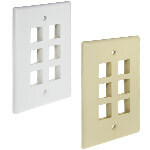 The Single Gang 3 Port wall plate allows for multiple points of access for keystone connectors and leaves an elegant finish for walls. 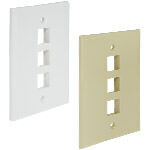 The 4-Port wall plate mounts flush onto any surface mount box or outlet and come with any hardware needed for installation. 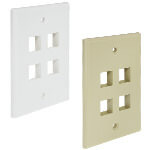 This Single Gang 6 Port wall plate mounts flush onto any surface mount box and provides the maximum amount of keystone mount connectors. 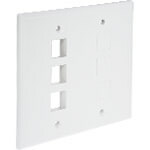 This Dual Gang 6 Port wall plate mounts to any larger gang surface mount boxes and has 3 ports on each side. 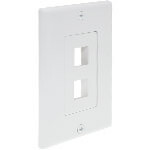 This Single Gang 2,4,6 Port wall plate offers keystone snap-in inserts and offers compatibility with all Decora-style outlets. If you are buying small quantity, we recommend you buy from the manufacturer if you do not see what you need on this page. If however you have a quantity requirement of 25 or more, let us quote the project since we custom manufacture metal products and will guarantee you a substantial savings over what the manufacturer s will charge you. Our finished product is usually superior to the manufacturers offerings since we often use a heavier, thicker material, color match, and professionally powder coat all our metal products. 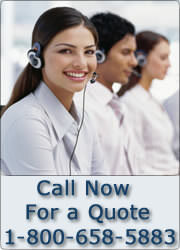 In addition, since we manufacture the jacks, we can populate the plates for you.